"Reception staff was well received." Have a question for Kimchee Busan Downtown Guesthouse? "The place was clean and conveniently located beside a metro." "Very near to station and lots of coffehouse nearby ." "The room is also big and clean." 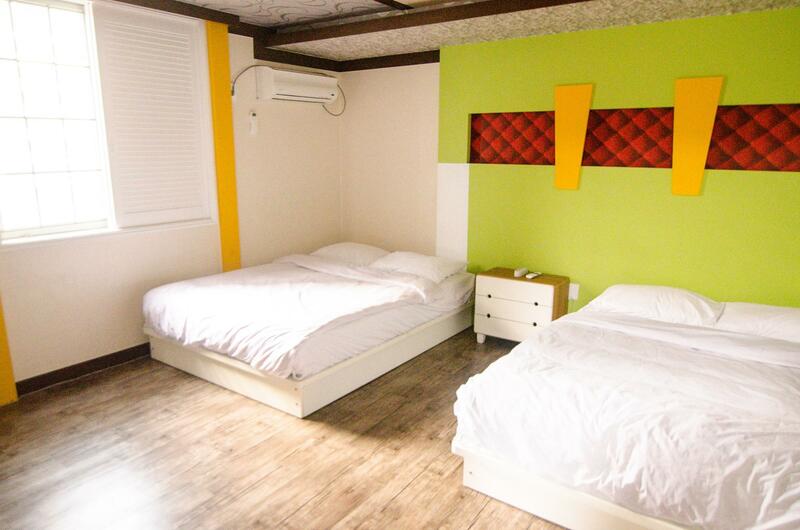 Well-positioned in Seo-myeon, Kimchee Busan Guesthouse is the ideal point of departure for your excursions in Busan. The city center is merely 1km away and the airport can be reached within 30 minutes. With its convenient location, the hotel offers easy access to the city's must-see destinations. At Kimchee Busan Guesthouse, the excellent service and superior facilities make for an unforgettable stay. 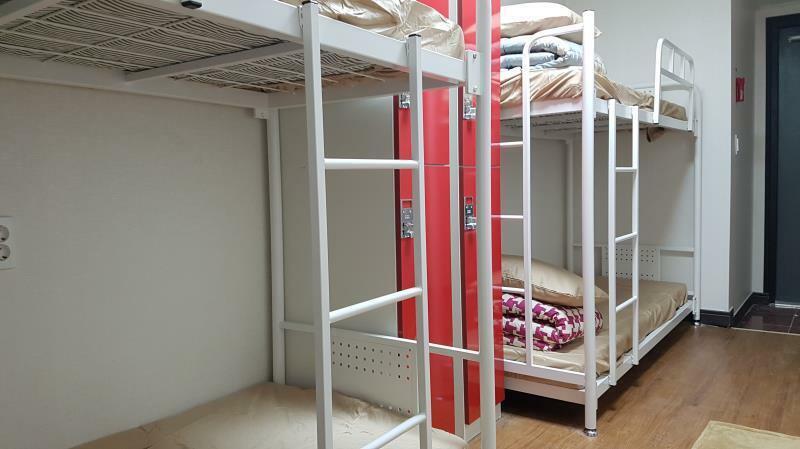 Free Wi-Fi in all rooms, laundromat, portable wi-fi rental, postal service, taxi service are just a few of the facilities that set Kimchee Busan Guesthouse apart from other hotels in the city. 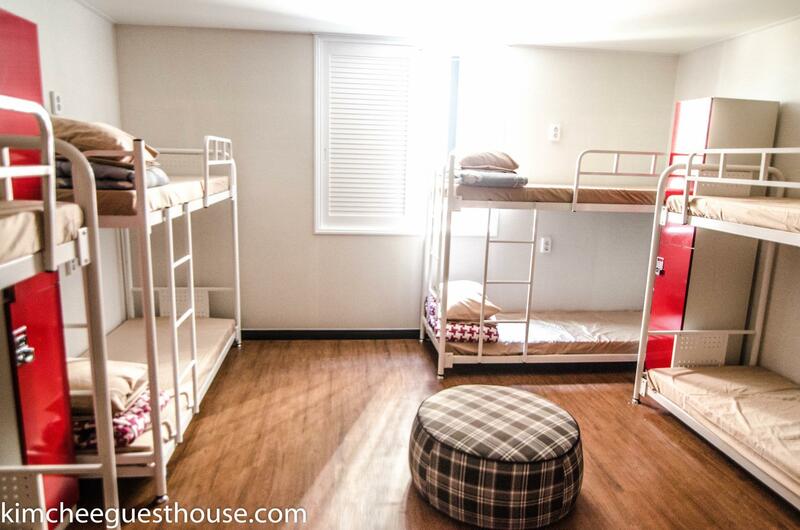 Kimchee Busan Guesthouse is home to 80 bedrooms. All are tastefully furnished and many even provide such comforts as towels, internet access – wireless, air conditioning, desk, internet access – LAN. The hotel offers an excellent variety of recreational facilities, including garden. Superb facilities and an excellent location make the Kimchee Busan Guesthouse the perfect base from which to enjoy your stay in Busan. "will still stay here next time I visit Busan." I really enjoyed my stay here. The sink basin in the women’s bathroom on the 4th floor clots up a little which was the only downer during my stay but apart from that, overall it’s a great hostel. The staff in particular are very helpful, friendly, and very accommodating. The social area was a little small but the small size paid of because I was able to meet and socialize with a lot of other hostelers which was great. I would definitely stay here again and would recommend it to others. Thanks for a great stay Kimchee! The best thing about this hostel is the people there. I met people from all around the world and made a lot of friends very quick. The location is good, 10 min walk from the nightlife center. 1 min from a 7/11, 2 min from subway. Great location, 2 minute walk to nearest subway station, great restaurants around close to nightlife, friendly staff! NEAR TO THE SUBWAY STATION AND BUSTOP. EASY TO LOCATE. ROOM IS CLEAN. TOILET IS OK. KITCHEN IS A BIT MESSY AS WE HAVE TO SHARE WITH OTHERS BUT ACCEPTABLE. THE STAFF WAS VERY NICE AND HELPFUL. I WOULD PROBABLY STAY HERE AGAIN WHEN I COME BACK TO BUSAN SOON! Everything is good until close to midnight when guests downstairs make lots of noise, obviously drunk. it continues for a few hours until they leave or if they ever. one of my worst nights adding on to my lethargy from hiking. Even though I was so tired from hiking, their noise woke me up in the middle of the night. If you want to sleep well, get ear plugs or pay more for a nicer place. Everything was okay during my stay. The place was clean and conveniently located beside a metro. There was a small problem with the shower that was fixed the same night. The only thing I wasn’t happy about was that I was told that The laundry machines were for staff only or their offered laundry service (5000 Won to wash, and another 5000 to dry) but throughout the hostel there are memos/posters advertising self service laundry for 4000 Won. Kind of annoying to long term travellers who consider laundry facilities when booking a place. We booked a family room. The room was spacious and clean. However, the pantry area was a bit disappointing as cutleries were not cleaned immediately by the guests. So, basically, you'll see unfinished food, used pots and pans and cutleries lying on the table and sink area in the morning. I had a pleasant stay in Busan thanks to Kimchee Guesthouse. I used the guesthouse as my base to have a place to stay and store my bagage at all times. Showers are good, beds are clean and the rooms are spacious enough for single travelers. Location is very good! Really appreciate the help of Sezer by the way. He was kind and helped me with information, my baggage and other tasks. Thumbs up! 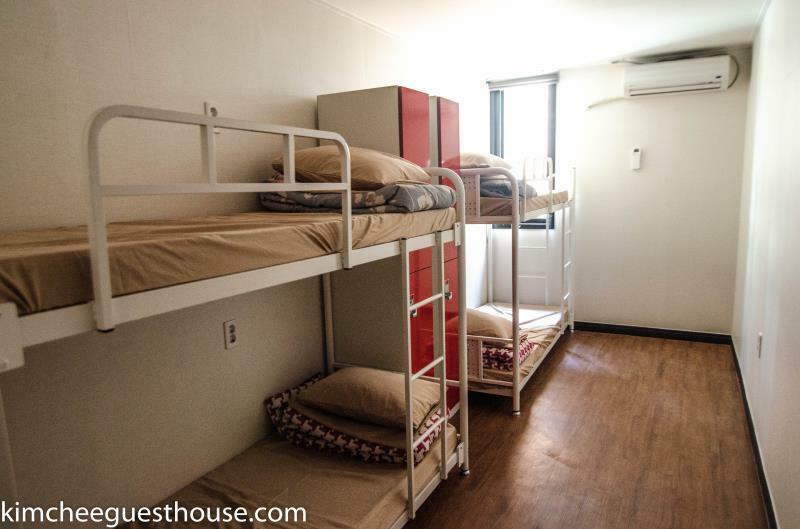 Though I have been hopping around guesthouses in Busan, there is definitely a lot of extra value in Kimchee guesthouse that comes down to the staff working in there. Not only are they willing to show you around and hang out with you, they also host different events which Victor kindly informed us about. The pub crawl as well as the rooftop party held in Gwangan were good ways to spend time and get to know more about the nightlife in Busan. Been staying in the guesthouse for longer than I expected. It has a great atmosphere and a big part of it is due to the staff members. Victor especially has provided with a lot of help and care for our needs while also being incredibly friendly and fun to talk to. The facilities are well worth the money itself, and the value added by the staff makes it one of the best experiences for travelers in Busan. 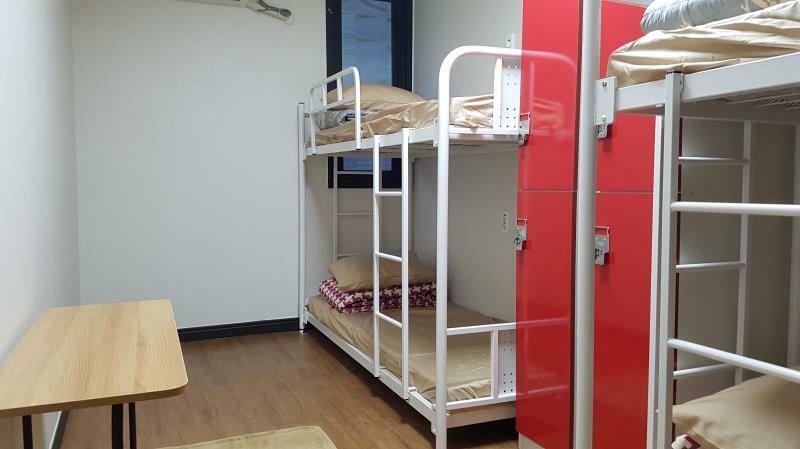 Kimchee has everything you could want in a budget accommodation. Clean, spacious rooms, helpful staff, information (on the walls) on everything to do and eat in Busan, rental wifi, plug adaptors for sale, etc. They've thought of everything. The living room is pretty comfy and a good place to meet people. It is a very large hostel so the vibe is not as friendly and cosy as some. You can easily walk to all the nightlife in Seomyeon, 1 minute from a 7/11, 2 minutes from the metro line 1 and 10 minutes from the 2; these will take you everywhere you need to go. The staff were always friendly and helpful, nothing was too much trouble. Only downside is the tiny kitchen that's usually very messy. Cooking here will be difficult. Had a great stay, I highly recommend it! Near to Beomnaegol Station (exit 8), this is the most important thing. You can just walk to Seomyeon Underground Shopping Center & Seomyeon Food Alley. The toilet & shower room is very clean. They have locker/luggage storage for each guest but no padlock. Bring your own padlock! But it is safe (I guess...). Didn't lose any of my stuff. The room is quite small for 6 persons. They have elevator but the waiting time is very very very long (urrgghh!!) Just use the stairs instead. From here it is very easy to go to other tourist attraction like Jagalchi Market, Busan Gamcheon Culture Village, Taejongdae Park, Gwangalli Beach, Oryukdo Skywalk. Just take the subway & bus. As a backpacker, I've stayed in many guest houses and this was the place where I felt like home because of the amazing staff!!! Kaan the staff always asked me how they can improve their service and if everything was okay. He was really helpful to me when I needed anything. I'll definetly come back to Busan and stay here without a doubt. Common sitting room is always a mess as well as dining room , wooden boxes instead of low tables in sitting-room., entrance door system.must be repaired, rooms are not cleaned everyday and sheets and edredons are not changed with every new customer so pillows are smelly. Volunteer receptionists are the best. great place if you want to meet people. so many people always coming and going and hanging out in the common areas. good for partying as well. great place to stay if you're a solo traveler looking to meet people. This is the first time I tried to stay at a shared room since I usually book a private room and bathroom. There were 10 of us in the room. There were 5 bunk beds. Since I arrived late, the only option I had was the top bed. It was hard to climb up the bed since the ladder was circular. I almost fell if I didn't have a good grip while going up. The bathroom was big enough for those that are staying there. There's no breakfast but there's water available. You can also cook your food there. The pantry is rather small. The location is good and there are restaurants nearby. I had a hard time getting my luggage back after leaving it in the morning at the front desk. There was no staff around and I had to rush since I have a scheduled train back to Seoul. There was no contact information at the desk where the owner's number is given. They should provide one next time for such cases. As for the price, it's quite cheap compared to other hostels. The staff were welcoming & very friendly. They had all of the essentials, free towels, free toiletries, free hair dryers, warm showers, a fully stocked kitchen, and even a bar on site (which sold soju cheaper than convenience stores nearby). The location was excellent, just a short walk to the subway & the airport bus. Great beds & great hospitality.